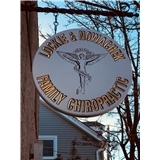 Lockie & Nowachek Family Chiropractic (Farmingdale) - Book Appointment Online! This is a Family Chiropractic office providing care for infants through the elderly, workers comp, no fault and pregnancy. Patients are educated about preventative health care. Conservative yet succinct care is given to each patient. Treatment is comprehensive and progressive, as the focus is the cause of the problem, not the symptom. As treatment is complete & patients are released from care, they are taught how to avoid exacerbation & given home exercises, proper nutrition advice & positive changes to avoid future problems. Drs Lockie & Nowachek are willing & able to advise on nutrition & natural supplements to aid in health & wellness, without drug side effects. I couldn't have asked for a better experience. The entire staff was warm and friendly, made me feel right at home! I have never felt more comfortable in a doctors office. If you have even the slightest interest about doing something about your back pain, they are the ones to help.